The 6th poster in d-m.com history to hit 30,000 posts. But how many of Doc's posts were actually posted by Doc? Does the 30k posts include here time before the forum system malfunction? A little late, but congrats Erica. I think you came to this site a Nash fan but stayed when we lost him. That was ages ago. Good times though! here's to a new year and to Luka resurrecting some of the ghosts from Mavericks past. Well I'm not a ghost. I actually come here periodically I just rarely post. Its so cool to see all the posters that are still active. What a fun time this place has been. So much fun and drama. I'm curious where some of the old posters are that dont come around. Like xerxes, smiles.... also I should have listened to Murph about chef ed. I learned my lesson there. Murph always speaks the truth. Edit: and sike! I miss that alien. Last edited by u2sarajevo; 12-29-2018 at 11:45 PM. Smiles still comes around from time to time..very rarely though. Wow, good to see some familiar names around! NOW WITH FREE REP WITH EVERY DRINK!! wow...you hadn't posted in how long? half a decade or more? 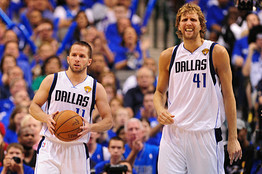 Dirk - "We should be ready to go to war." 7 years between posts, then 2 in 24 hours! I may need some refreshers on what's happened, it's remiss of me to not pass on my congratulations to Erica, well played!